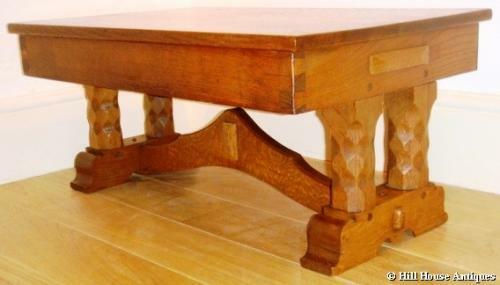 A rare and unusual early period Cotswold School low table in oak, the top raised on heavily chamfered/typically facetted legs; attributed to H Pugsley, who was Ernest Gimson’s first cabinetmaker (albeit short lived) before he took on Harry Davoll in 1901. Carved initials HP and date of 1906 to the underside curved stretcher. An example of Pugsley’s work is an oak chest of drawers designed by Ernest Barnsley and made by H Pugsley in 1902, illustrated on p.107 fig 71 in the book, Gimson and the Barnsleys by Mary Comino. The work is also very similar to the later work of Arthur Romney Green, who himself was clearly influenced by Gimson and had visited his workshops in Sapperton in 1904.